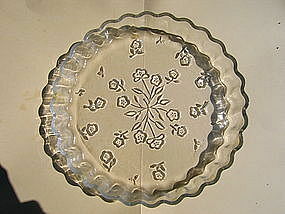 Vintage 10 inch clear glass quiche or tart pan with an exterior floral design. I am not sure of the maker, but it is possible that is from Anchor Hocking. It is simply marked as oven proof. There is no damage. A large bowl in this pattern is available. I need your zip code to calculate the postage.